No-one but specialists using genetic methods can distinguish one dark septate fungal root endophyte from another. An analysis of their distribution in the northern hemisphere is now available for the first time -- and a mystery is afoot. Switzerland is a biodiversity hotspot in relation to the worldwide distribution of dark septate fungal root endophytes (DSEs) of the genus Phialocephala. There are 21 known species, 19 of them found in Switzerland, as shown by a new study by Christoph Grünig, Senior Scientist at the Institute of Integrative Biology of ETH Zurich. Mycologists have analysed more than 5500 samples from North America, Europe and Asia and determined the species present in them - genetically, because the fungi, which live in root cells, are morphologically indistinguishable from one another. This revealed that Switzerland is home to almost all the species; the researchers were unable to find only two species. The place with the world’s greatest abundance of DSE species is in a primeval forest in the Creux du Van rock basin in the Neuchâtel Jura mountains, where the mycologists detected ten species in just a few square metres. Locations in a tree nursery in the Swiss Mittelland and at Catherine Creek in Oregon contain eight species. However, Phialocephala fungi have scarcely any distribution in the southern hemisphere. Where they do occur, they were probably introduced from outside, although researchers in Patagonia only recently discovered a location where the fungi probably also occur naturally. Nevertheless, the distribution of DSEs mystifies the mycologists. Certain patterns are as incomprehensible as the preference for particular tree species with which the fungi live in a symbiotic relationship. The only clue is that primeval forests seem to be more species-rich than commercial forests. They were also unable to detect any correlation between climate and temperature and the occurrence of Phialocephala species. Furthermore, these fungi do not form any communities that would be typical for a particular habitat. Individual species have a scattered occurrence with a variable frequency in Asia, Europe and North America. Grünig concludes that, “The distribution does not follow any pattern, and which species is found and where is most probably pure chance.” Mycologists have hitherto been unable to find out how the subjects of their studies were able to spread across the whole of the northern hemisphere. Grünig says, “The spores would have to fly.” How the fungi, which spend their lifetime in the root cells of various forest trees, form spores that are able to become airborne and which moreover must be flung far enough up into the air to allow them to be caught and transported by high-altitude winds, is still unclear even today. Paradoxically, spruce seedlings raised under sterile conditions in the laboratory and transplanted into natural surroundings were not colonised by Phialocephala. However, that would indicate that the fungi spread rather poorly. Nor is there any evidence so far to suggest that, for example, spruce seeds contain the fungi and that they are distributed in this way. However, Grünig stresses that, “Population genetics and bio-geography support the idea that the fungi spread well.” For example, Phialocephala helvetica has been detected from Nevada, USA, through Sellenbüren in Switzerland and all the way to Lake Baikal. This organism seems to have no problems in overcoming large distances. This is why the ETH Zurich researcher wants to stay with the question of how the fungi spread out in the northern hemisphere. “We would need to try to filter the air and detect the spores it contains.” He has already submitted a corresponding project. Research on dark septate fungal root endophytes is difficult because of their secretive lifestyle. Their ecological function is still unclear. Although they always live in symbiosis with a tree, the question of whether they damage or benefit plants has not been resolved. You cannot tell whether a tree is colonised by Phialocephala by looking at it. Grünig is convinced that, “For the plant, symbiosis with these fungi is more likely to be associated with costs.” One hypothesis is that DSEs are weak pathogens with which trees protect themselves from more powerful pathogens. Thus the tree is choosing “the lesser evil”. Until recently, Phialocephala was regarded as a single species. 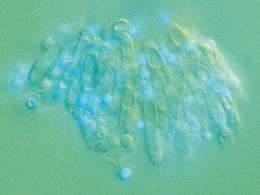 Only genetic studies have allowed this one species to be divided into almost two dozen individual fungal species. Grünig has described eight of them.